Andrea Tögel Kalivodová - Opera singers - Agency - Agency, Publishing, Studio - Hudební agentura ARCO DIVA Management s.r.o. She graduated from the Conservatoire of Music in Brno (under Prof. Jarmila Janíčková), and she achieved her first remarkable singing success. 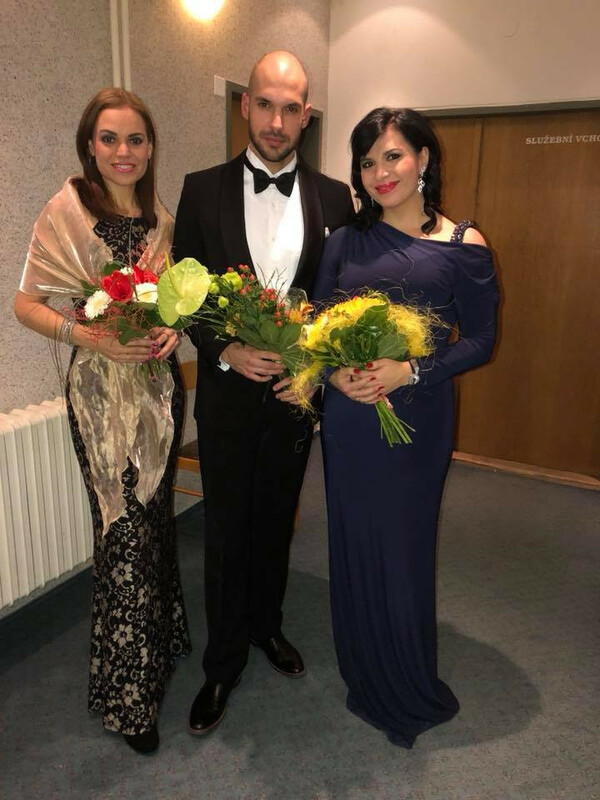 For example she became the absolute winner in the singing category in the National Competition of the Czech Conservatoires in Pardubice (1998). She continued her studies at the Music and Dance Faculty of the Academy of Performing Arts in Prague (at Naděžda Kniplová). During her studies, she was taking part in the international master classes under the tutelage of prestigious schoolmasters and artistic personalities (Ralf Düring, Franz Lukasowski, Alexe Gall, Eva Blahová, Fabio Luissi, Otto Schen and other). In the end, she decided to accept an invitation for a short term attachement at the University of Music and Performing Arts (Universität für Musik und darstelle Kunst) in Vienna where she studied for one year. Her singing and foreign studies introduced the young artist to singing competitions where she often was awarded with its laureate title. For example, in 2001, she achieved a great success in London where as a young talent, she won the first prize of the Ema Destinn Foundation in the International Singing Competition "The Anglo-Czechoslovac Trust", and she was invited to a concert of the young promising singers in the London "Covent Garden" where she successfully made her debut. She also became one of the semifinalists in the Belvedere International Singing Competition in Vienna. Among the Czech singing competitions, she took part in the International Singing Competition in České Budějovice (CZ/Budweis) in 2000, where she won in category A. During her studies she started to perform as a guest and cooperate with prestigious opera theatre stages. In 2001, she first made her debut at the Prague State Opera in the "The Pounding On the Iron Curtain" project (an anthology of two operas by Vladimír Wimmer). In 2002, she premiered at the Ostrava National Moravian-Silesian Theatre in the role of Kontshakovna in the opera "Knjaz Igor". In Autumn of the same year, she accepted an invitation to tour the great opera "Xerxes" with the production "Opera Praha". For this opera, she studied the role of Amastrys, and successfully toured Germany, Switzerland, France and Luxembourg. Since 2002, she has been performing as a guest in the Prague State Opera. In 2003, she accepted an engagement, and she began her residency at the Prague State Opera. There, she has performed multiple beautiful roles - the Third Lady in "The Magic Flute", Maddalena in "Rigoletto", Rosalia in "The Lowlands", Alisa in "Lucia di Lammermoor", Ježibaba-Witch in "Rusalka", Suzuki in "Madame Butterfly", Fenena in "Nabucco" and above all, "Carmen", which she sang in the Košice State Opera in Slovakia. 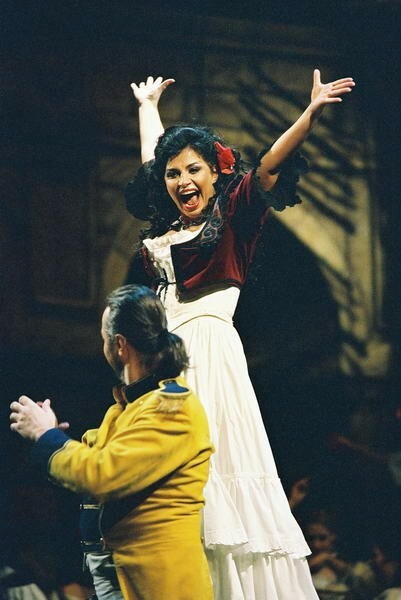 She also performed as a guest in the role of Carmen in the Hungarian Sopron. In December 2003, she performed together with the New York Metropolitan Opera soloist Leo Nucci at a concert at the Prague Žofín Palace. In June 2004, she took part in a gala concert in the Great Hall of the Vienna Konzerthaus to celebrate the acceptance of the Czech Republic to the European Union. She performs in concerts throughout almost all of Europe and she has also visited Japan, Korea and the USA several times. In 2005, she took part in an European Stars Tour on the occasion of the 60th anniversary of the end of the Second World War. She has visited the representative BOZAR-Palace of Fine Arts in Brussels and the Kremlin Congress Palace in Moscow. She has had the pleasure of collaborating with prestigious conductors such as; Gaspar Zehndler (The Prague Chamber Philharmonic Orchestra), Petr Vronský (The Prague Radio Symphony Orchestra), Leoš Svárovský, František Preisler, František Drs, Jan Chalupecký, Enrico Dovico, Hilary Grifits, Fabio Luisi and other. In Autumn 2005, she sang Suzuki in Puccini's "Madame Butterfly" led by the legendary conductor Bohumil Gregor on the at the Prague State Opera. She has been performing in the Prague State Opera since 2002, and she has worked there as a soloist since 2003 (today the Prague National Theater). The last role so far that Andrea Kalivodová has produced in her home stage is the poetic Dulcinea (directed by Jiří Nekvasil, conductor Heiko Mathias Förster). In April 2008, she performed the role of Carmen in the monumental version of this famous opera by G. Bizet in the O2 Arena in Prague. She has also performed in this unique production of Carmen in other European cities (such as Budapest, Mannheim, Freiburg). Andrea Kalivodová has also performed as Carmen in almost all Czech opera houses; in addition to the State Opera and the National Theater in Prague, she has also sung Carmen in Brno, Ostrava, Liberec, and Ústí nad Labem. In July 2009, she performed on the revolving stage in Český Krumlov, in the opera Rusalka in the role of the Witch. The production was directed by Josef Průdka, and conducted by the conductor of the Metropolitan Opera in New York, John Keenan. 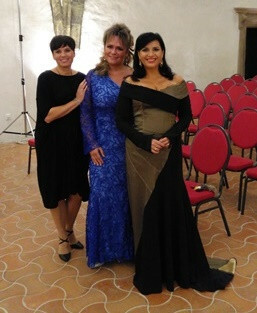 Andrea Kalivodová also writes her own songs, and she is currently starring the the show Alma Mahler, Her Life and Songs, together together with pianist Kristina Kasíková and Valérie Zawadská, who reads the autobiography of Alma Mahler. Andrea Kalivodová also entered the world of operetta. In the Musical Theater in Karlín, she hosts the most famous operetta of Oskar Nedbal, "Polish Blood", in the role of soubrette Wanda. As part of her concert work, Andrea Kalivodová performs throughout Europe, America, Japan, and other countries. At the end of 2011, Andrea Kalivodová's debut album, "The Paths of Love", was released, which is a LIVE recording of her successful concert at the festival Music of Thousands Mahler Jihlava 2011. Andrea Kalivodová chose to sing Czech music at the festival. This includes classic and well-known titles, such as a the cycle by Antonín Dvořák "Gypsy Melody", which contains one of the most popular songs "My Mother Taught Me". The other songs are from the twentieth century - most of them based on folklore inspiration. In addition to a selection of songs by Bohuslav Martinů and Leoš Janáček, Andrea Kalivodová sang an inner love cycle by Petr Eben "Secret Songs", and in particular two songs that are rarities - the ballad by Jan Kunc "Kate Standing on the Bank of the Danube", and the ballad by Ostrčil "Orphan Child". Andrea Kalivodová is a frequent guest of the media; she appears on television, in the radio, and she always combines these activities with spreading the good name of the opera. She is also intensively involved in charity projects, the most important of which is her support of IKEMU - patients with pulmonary arterial hypertension, and the CEREBRUM association, which helps people with brain injuries. Ms. Marie Martínková (housewife of Ema Destinn) is remembering of Ema Destinn´s life. It is a music-dramatic program.